The unequal equalisation of one’s ears can cause a type of dizziness described as alternobaric vertigo, a common cause of vertigo that occurs in divers. Learning how to equalise ear pressure is part of every diver’s basic entry-level training. Whether one is breathing compressed gas or freediving, changing depth requires the equalisation of one’s middle-ear pressure to the ambient (surrounding) pressure. Most divers are able to equalise effectively without major difficulty, employing a variety of techniques, from jaw movement to the Valsalva manoeuvre, usually choosing the method that minimises middle-ear stress with the least effort. Most divers understand that a failure to equalise properly during descent or ascent can produce discomfort and in some cases it may cause substantial pain and the risk of injury. What many divers do not realise is that the unequal equalisation of the two ears can produce other problems that should be acknowledged. This article will focus on one in particular, namely alternobaric vertigo (ABV). The changes in ambient pressure affect the gas volume of the air spaces within and adjacent to the body. Internal spaces include the lungs, sinuses, middle ears, gastrointestinal tract and possibly the teeth. Adjacent spaces include the mask, drysuit and sometimes the outer ears. Some equalisation occurs automatically for healthy divers under normal conditions. The gas volume in the lungs and sinuses equalise during breathing, the gastrointestinal system can generally accommodate gas pressure changes, and teeth, fortunately, rarely have closed gas cavities. The gas volume in drysuits and masks is easily adjusted with auto-inflate and exhaust mechanisms and by exhaling through the nose, respectively. Gas in the ear canal under a tight hood can be eliminated by briefly pulling away the hood to allow water to displace the air. This then leaves the middle ear to actively equalise the pressure on descent and passively equalise the pressure on ascent. A difficulty in equalising middle-ear pressure can create problems for divers. The purpose of pressure-equalising techniques is to open up the Eustachian tube, a duct that connects the back of the throat to the middle ear. The Eustachian tube allows gas to pass between these two spaces, thereby balancing the pressure. On the surface, where ambient pressure changes are small, the equalisation of the middle ear and the ambient pressure occurs naturally, like when we yawn, swallow, laugh or chew, for example. The equalisation of one’s middle-ear pressure is essential to avoid damage to structures involved with hearing and balance. Functionally, sound waves (pressure waves) make their way through the outer ear canal and across the eardrum. The eardrum translates the waves into vibrations, which then pass through three small bones in the middle ear (the malleus, the incus and the stapes) and into the inner ear. The stapes transfers the vibrations from the middle ear through the oval window and into the fluid-filled spaces of the inner ear. The inner ear is separated from the middle ear by two delicate membranes, namely the oval and round windows. The oval window acts as a direct line of communication to the cochlea (sensory organ for hearing), which then translates pressure stimuli into sound. However, changes in pressure can also stimulate the fluid-filled semi-circular canals of the vestibular system, which interpret head motion and orientation for balance. The right and left cochlea can receive different sound stimuli, which allow for source localisation (distance and direction). Balance sensing is based on the co-ordination of the semi-circular canals between the two ears. A mismatched stimulation of the vestibular system is problematic. If the difference results from a pressure imbalance, a condition known as ABV can result. ABV is a highly-descriptive term coined by Dr Claes Lundgren in 1965 . Alter means “other”, bar means “pressure”, ic means “the condition of”. Vertigo is the perception that the body or its surroundings are spinning or moving. ABV arises from the unequal pressure between the two middle ears, usually because the pressures are changing at different rates. A failure to equalise pressure symmetrically can cause the brain to erroneously perceive the difference as movement. Nystagmus, which is the involuntary rhythmic movement of the eyes, can also occur, as can nausea and vomiting in severe cases. In addition to visual disturbances, ABV events may be accompanied by the feeling of fullness, ringing in the ears and muffled hearing in one or both of the ears. Some divers may notice a hissing or squeaking sound, indicating poor equalisation, prior to the onset of ABV. Also, women appear to have a greater susceptibility ABV than men do . Cases of ABV are often unreported, either because no ill effects resulted or, in cases where the condition prompted a panicked response, the victim was unable to provide a report. Panic arising from unexpected disorientation can prompt a diver to bolt to the surface and can potentially lead to a serious or fatal injury. A retrospective study found that 27% of subjects reported a history of ABV associated with diving . A prospective study found symptoms of ABV in 14% of subjects who have completed monitored dives . One can reduce the likelihood of ABV by using effective equalisation techniques (early, often and with the most appropriate technique for the person) and by not diving when congested. The need to exert high pressures to equalise during descent can make equalisation during ascent, which is usually a passive process, more difficult. The impact can be substantial if the soft tissues have been made swollen by overly-aggressive or poorly-conducted equalisation manoeuvres. If properly-conducted equalisation manoeuvres fail, one should abort the dive and evaluate the situation before trying to dive later. Some divers find it easier to equalise in a head-up position. Performing gentle, active equalisation techniques early and often during descent will help to reduce the stress on one’s ear structures. Divers who encounter frequent ABV should re-evaluate their equalising techniques and possibly their buoyancy control – that is after being cleared to dive following medical evaluation. Any condition that can cause the inflammation and congestion of the ears and sinuses could increase the likelihood of equalisation problems such as ABV. Individuals who choose to dive despite symptoms of congestion or illness may be putting themselves at risk. Diving with congestion could also lead to reverse block, which is a condition where gas becomes trapped in the middle ear. A diver might manage reverse block by descending slightly and then re-attempting a slower ascent. If this fails to work, however, the diver will have little choice but to risk more serious injury while continuing the ascent as slowly as possible under the circumstances. Ample gas supplies and conservative diving profiles will give the diver additional time to deal with any equalisation issues that might arise upon ascent. Some divers may choose to rely on nasal decongestants as a solution for diving with congestion. Decongestants relieve symptoms temporarily, but they can mask further issues. Using decongestants for four or five days may result in rebound congestion, making it more difficult to equalise. Divers who become disorientated and panic when they experience ABV can face more serious problems if an uncontrolled ascent follows. It is important to remember that ABV symptoms will wane as the unequal pressure resolves. A diver should not attempt to force equalisation while experiencing ABV, since this could make symptoms worse or damage delicate ear structures. If symptoms consistent with ABV develop, the best protection is to recognise the problem and to keep a calm state of mind. By holding a fixed depth that is assisted by a fixed visual reference or a physical connection to an unmoving feature, like a rope or the seafloor, a diver can wait for the symptoms to subside. The sudden onset of vertigo can be both a frustrating and disorientating experience for divers. If ABV symptoms are experienced during the beginning of the dive, the dive should most likely be ended. If ABV symptoms are experienced later in the dive, the focus should be on how to end the dive safely. In most cases, ABV symptoms are self-limiting, so it is important to remain calm until the symptoms resolve on their own. Divers who educate themselves about ABV will be in a better position to manage the symptoms and minimise the risks if an event does occur. WHAT IF THE SYMPTOMS PERSIT? Symptoms that last for more than a few minutes may indicate a more serious condition. Large changes in middle-ear pressure without proper equalisation can lead to middle-ear or inner-ear barotrauma. 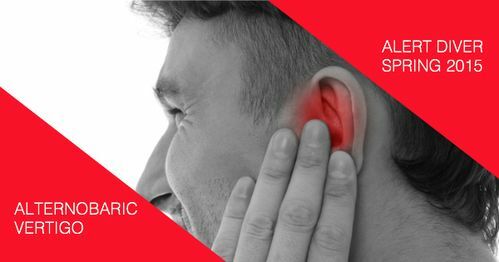 Poor equalisation can cause the eardrum to stretch to the point of injury. A diver may experience a sharp pain as the eardrum ruptures, possibly followed by transiently severe vertigo driven by the rush of relatively cold water into the middle ear (caloric vertigo). These symptoms will similarly subside as the temperature difference wanes. The treatment of mild cases may include decongestants and antibiotics. Non-perforating injuries may heal in a few days, while ruptured eardrums can take six weeks or more to heal. In severe cases, surgery may be required. Inner-ear barotrauma is a pressure injury to the sensory cells of the inner ear, which may or may not involve the perforation of the round or oval windows. It is a much more serious condition that requires medical attention and, frequently, surgical intervention. Divers may experience prolonged severe vertigo, hearing loss and ringing in the ears. In any case, active equalisation should be avoided until the trauma has healed. Divers can often return to diving after an eardrum perforation, but inner-ear barotrauma may be a long-term contraindication. Inner-ear decompression sickness (DCS) can present symptoms similar to inner-ear barotrauma and must be treated in a hyperbaric chamber as soon as possible. Kitajima, N. Sugita-Kitajima, A. & Kitajima, S. Altered Eustachian tube function in scuba divers with alternobaric vertigo. Otol Neurotol, 2014; 35(5): p850-856. Klingmann, C. Knauth, M. Praetorius, M. & Plinkert, PK. Alternobaric vertigo — really a hazard? Otol Neurotol, 2006; 27(8): p1120-1125. Lundgren, C.E. Alternobaric vertigo — a diving hazard. British Medical Journal, 1965; 2(5460): p511-513. Uzun, C. Yagiz, R. Tas, A. Adali, M.K. Inan, N. Koten, M. & Karasalihoglu, A.R. Alternobaric vertigo in sport scuba divers and the risk factors. J Laryngol Otol, 2003; 117(11): p854-860.